Turning 60 is a game-changer! Enjoy great savings and benefits for seniors! Turning 60 is a great milestone! There are so many things to look forward to, including a host of exciting perks and many incredibly valuable benefits especially geared at the over-60s. You’ve Earned It/YEI is in the business of tracking down the best savings and benefits that we can find for South … Continue reading Turning 60 is a game-changer! 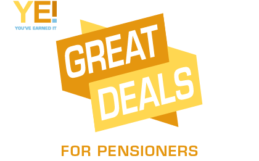 Enjoy great savings and benefits for seniors!